After more than two decades of service as a workhorse for the U.S. Army and U.S. Army National Guard, the C-23 Sherpa is history. Named after the rugged people of Eastern Nepal, few aircraft have been more aptly named than the C-23. Although the C-23 is leaving military service, a handful of Sherpas may find new employ in the wilds of Alaska. Manufactured by Short Brothers, before their acquisition by Bombardier in 1989, the C-23 resembles a flying box. The C-23 entered National Guard service in the early 1990s, flying in missions ranging from humanitarian disaster relief to combat support missions. “The C-23 provided disaster relief during hurricanes, the oil spill in the Gulf of Mexico, forest fires, flooding, blizzards and the earthquake in Haiti, and was also used during the Winter Olympics in Vancouver, B.C.,” said CWO5 Clarence Shockley. Shockley serves as an instructor pilot and instrument examiner for the Operational Support Airlift Agency (OSAA). 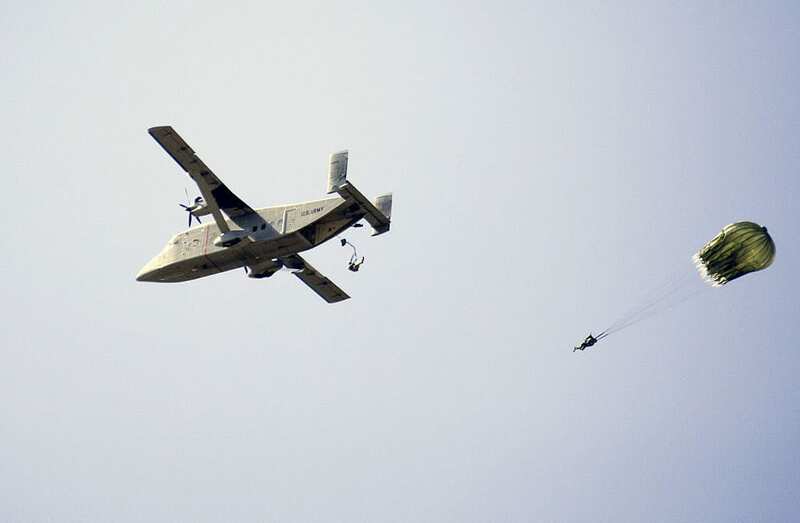 The C-23 also was used in the support of Army parachute-drop training missions. 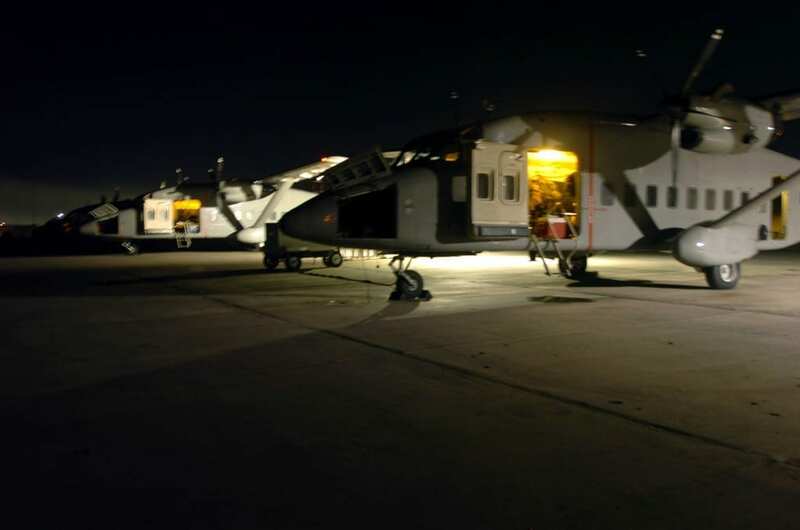 Besides seeing service in Operation Desert Storm, the C-23 also participated in operations related to Operation Iraqi Freedom and Operation New Dawn. “The C-23 provided limited rear support during the Persian Gulf War,” said Maj. Matthew Moore, chief of future operations with OSAA. “However, it saw continued action from 2003 through 2011, in Operations Iraqi Freedom and New Dawn, often moving half-a-million pounds of cargo a month,” added Moore. Known for its versatility, if not for its creature comforts, the Sherpa excelled at operating where other aircraft, for a variety of reasons, could not. “A C-130 simply cannot land at every location. Sometimes a CH-47 is too expensive to operate for a light load. IT was another tool that was cost-effective in homeland defense, disaster preparedness, and the Global War on Terrorism,” said Shockley. Although not pretty to look at, the C-23 has earned a reputation as a reliable and steady aircraft. To illustrate that point Shockley shared a story of a 2009 flight he was piloting, where the cockpit side window blew out. “It was a little noisy and cold, but where are you going to land when you are over the North Atlantic? We landed in Keflavik, Iceland, without any problem,” said Shockley. It was Shockley who was part of the crew that flew the final C-23 in the inventory on its final flight. The C-23 was flown from Egypt back to the U.S. and despite delays due to electrical issues and inclement weather, Shockley still found himself waxing nostalgic. “It was a privilege to have had the opportunity to fly the last Sherpa into retirement and the greater privilege was to have served as a crew member with those hardworking quite professionals,” said Shockley.